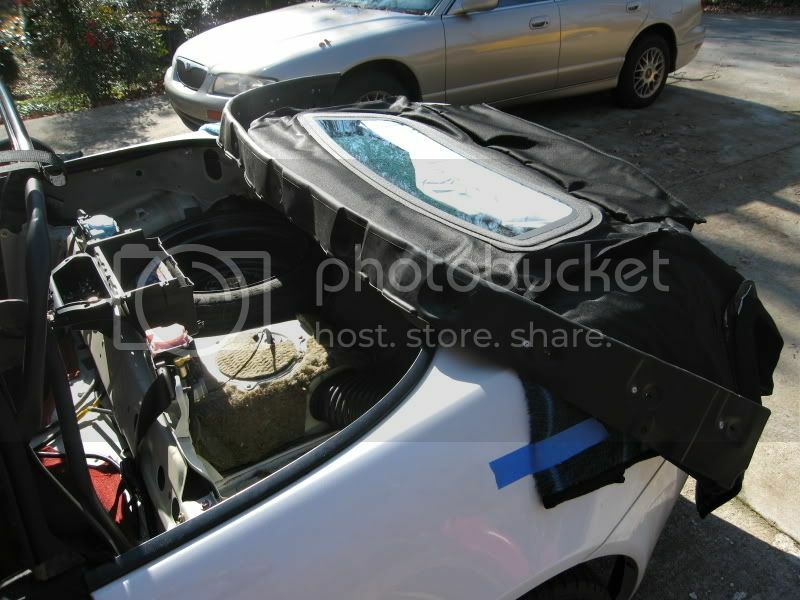 For those that don't know, it's very bad to raise and lower the convertible top with a plastic rear window when it's cold outside (below 50F or so). The plastic gets very brittle and will crack right in half. That's pretty much what happened with this owner. There were two options for him at this point, buy a Honda OEM replacement for $800 or so, or get a Robbins replacement top with a glass rear window for a lot less. I offered to do the install at a discounted price since this was going to help me out as well. The following is a complete walk through. Some tiny details are missing due to forgetting to take a picture every time I took something apart, but anybody that's fairly handy can handle this. I will say that while it is possible to do the install completely on your own, it is a HUGE lifesaver to have one extra person even if they have no mechanical skills at all. The Robbins kit includes some rivets, silver buttons, new elastic straps and retrofit straps if you're doing an upgrade to a glass back. I recommend having extra 1/4" long 4mm ( 5/32") rivets handy. 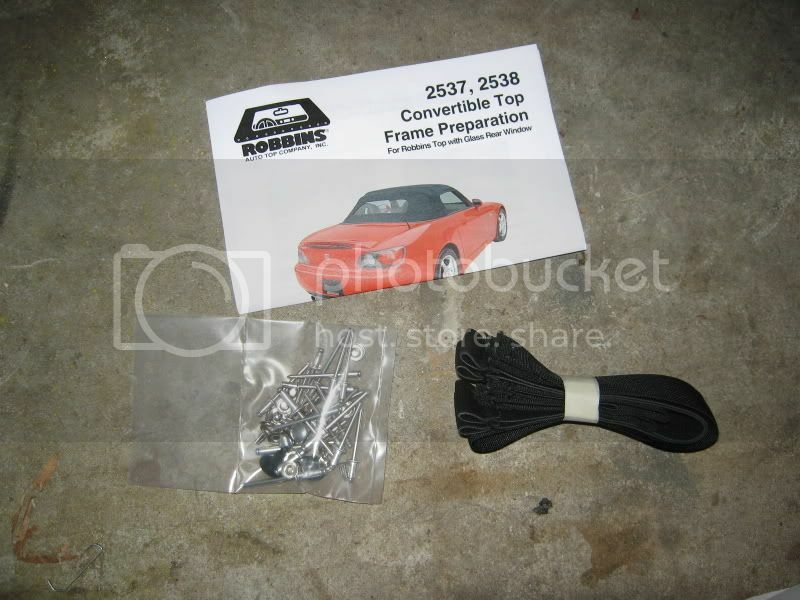 They work perfect for attaching the rain rail and are easy to install with a flathead. A pack of 25 will be more than enough. Ok, now that you have all the tools we can start removing the old top. No need to be fancy here. Just grab a razor and slice it up. While cutting behind the window, you'll notice the plastic guard behind the top. 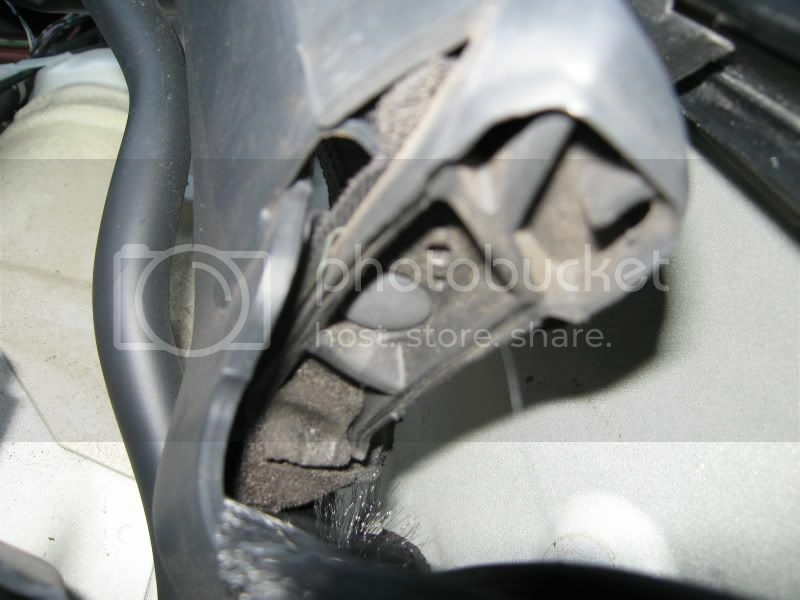 This is the cause for the small wear holes that are common on our cars. You can see the start of the wear hole on the second pic. Before putting the new top on, I cut two squares of material off the old top and put the between this plastic guard and the new top with adhesive. 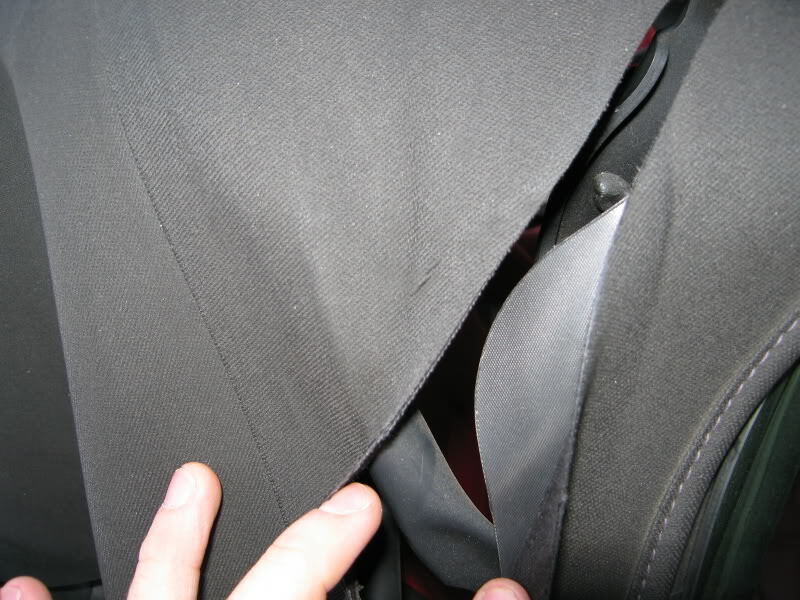 This can be done to existing tops as well and is highly recommended to prevent these wear marks from forming. After the top is cut off (still no hardware removed), I unpacked the new Robbins top with glass window. It comes with retrofit straps for the 00-01 frames to accepts a glass window and a bunch of rivets and some buttons that won't get used. Next, I remove the seats. 12mm bolts on the front and 14mm for the rear. Very simple. 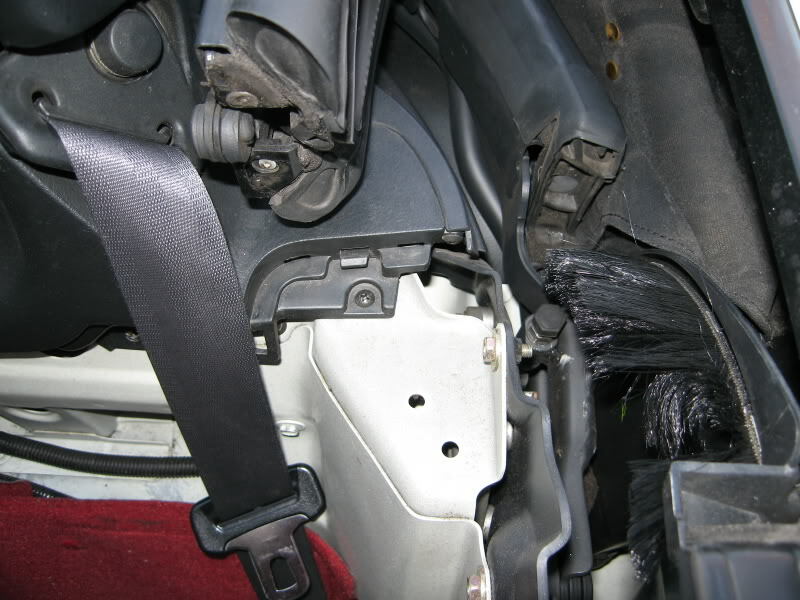 Be careful when taking out the driver's seat as there is a grey harness that needs to be disconnected from the bottom. 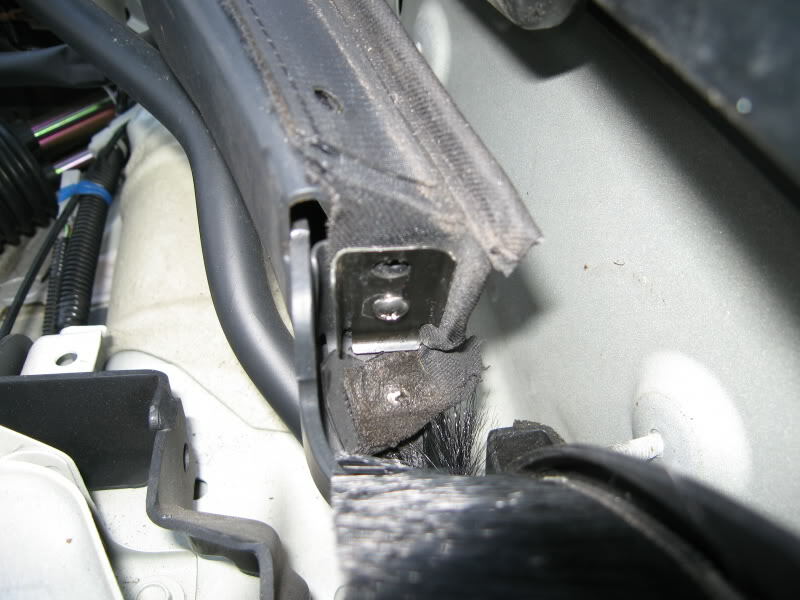 This is your seatbelt sensor. 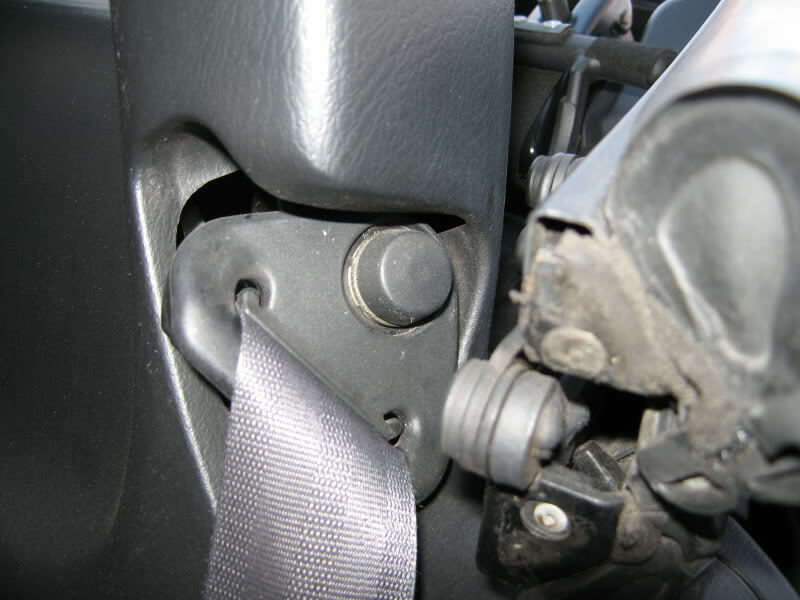 Also, if you have an OEM alarm, your alarm module will be on the underside of the driver's seat and will need to be disconnected as well. 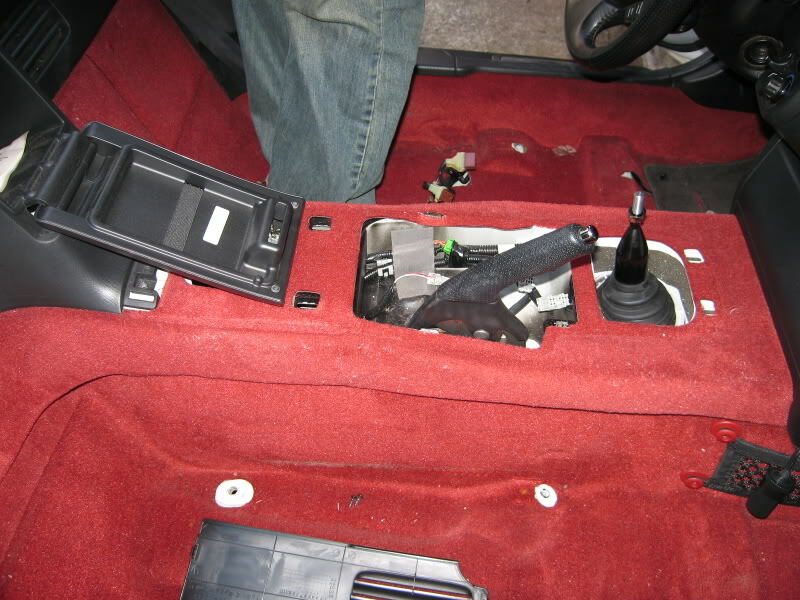 Next, remove the center console. The console is held on completely with clips and should be taken off by prying the rear up with your fingers and moving forward slowly. Take off the shift knob first of course. 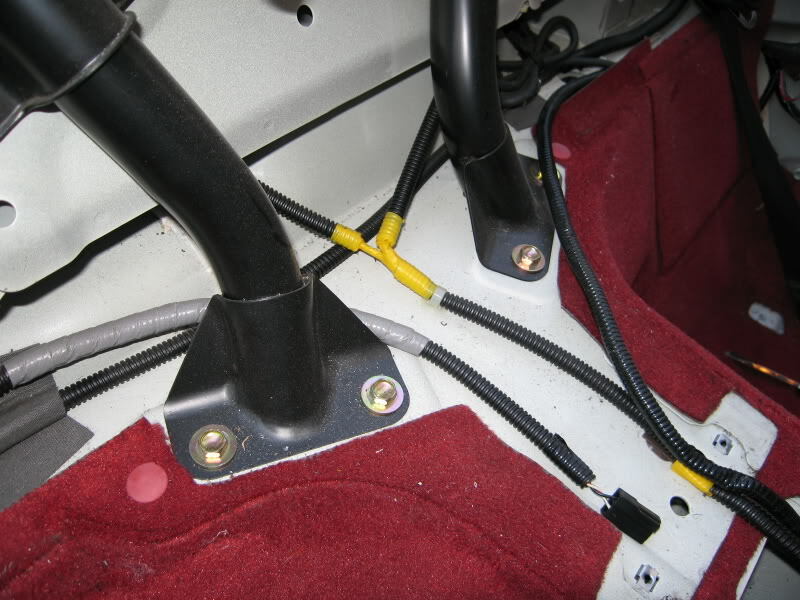 When the console is unsnapped, disconnect the two harnesses for the emergency lights and top switch. 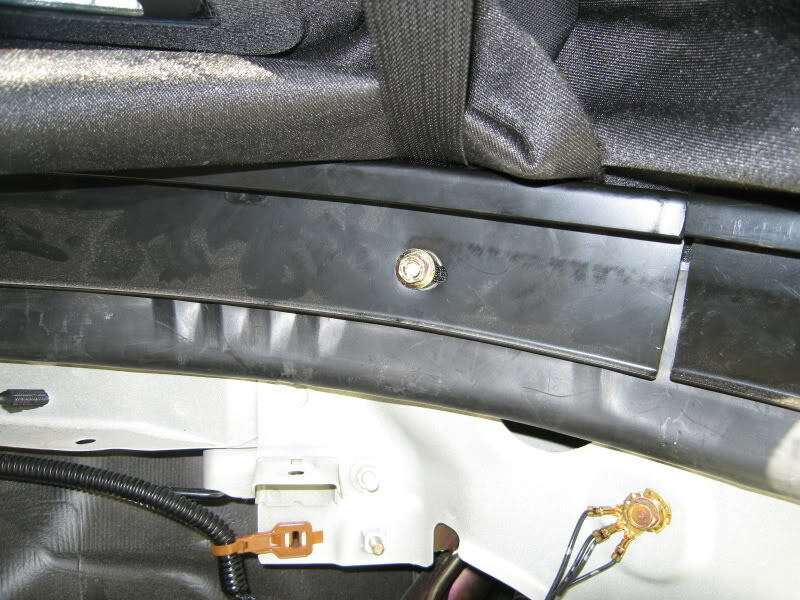 After the console is removed, take the roof switch off by removing the two screws and reconnect it to the harness. You'll need to work the roof while doing the install and the whole console will just get in the way. 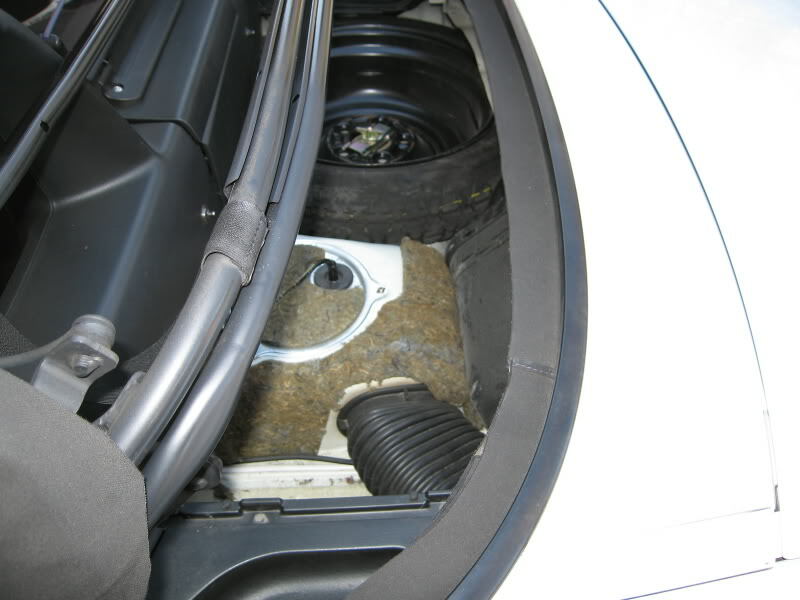 Start removing the two vent panels under the roll hoops. This is done by unsnapping the cover on the two hooks and unscrewing them using either a phillips or 8mm socket. The panels then just unsnap out of their location. 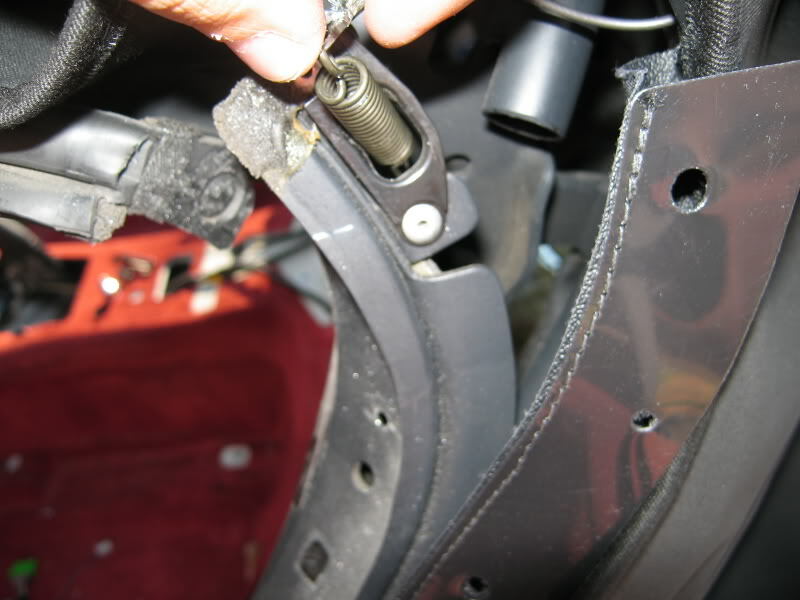 Go ahead and remove the two screws at the base of the roll hoop trim while you're at this step. Make sure to keep inventory of all the screws. Most of them are identical. Pay attention to the ones that are smaller or different so you know where they go back later. 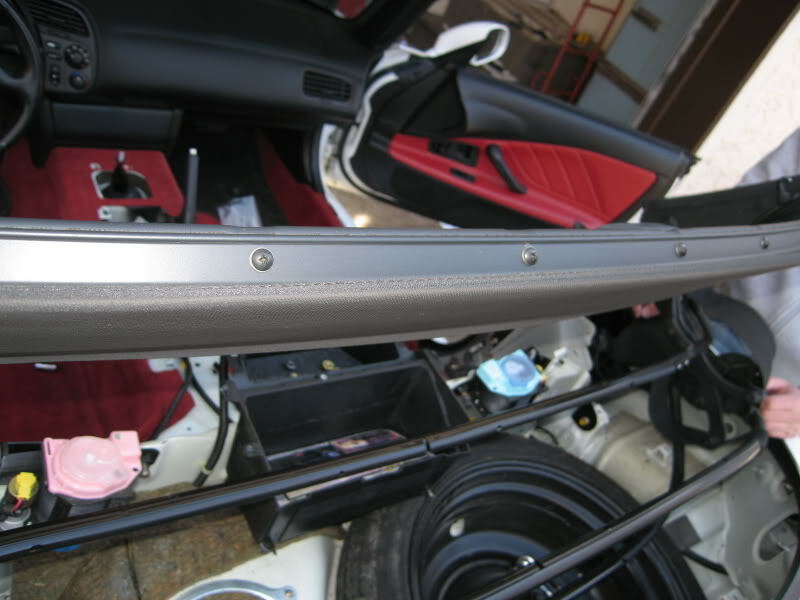 Remove the two door sill moldings. They snap off. It's easiest to start towards the front of the car and move backwards. 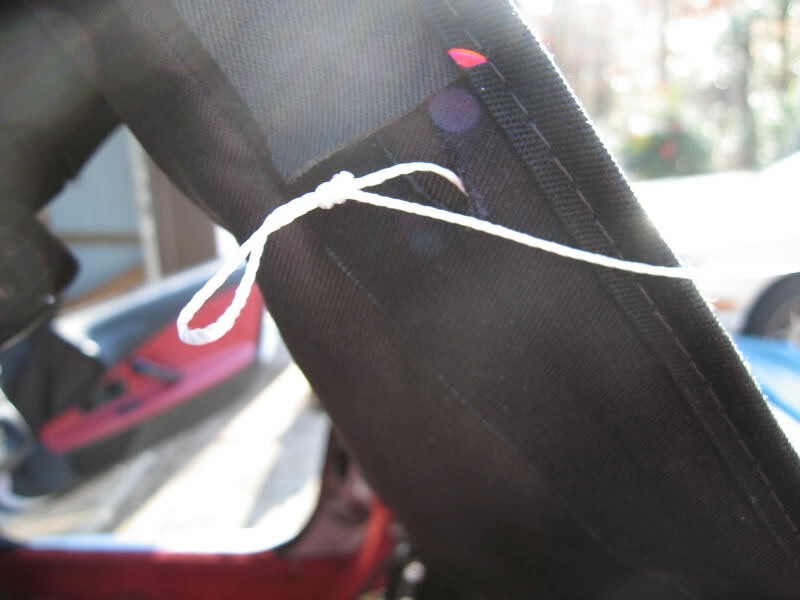 They are held on with three white clips and interlock with the surrounding trim. 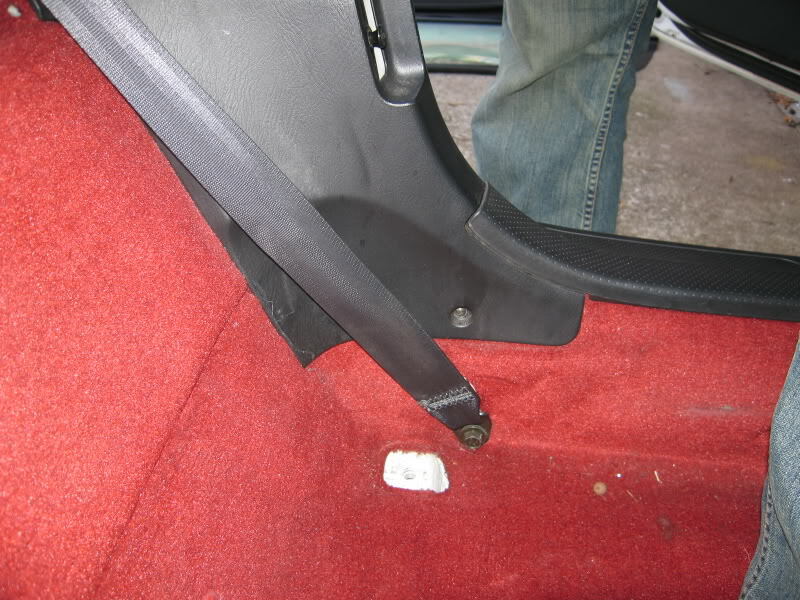 Then, remove the rear door jamb trim. This is done by removing one phillips screw at the base and pulling the panel forward. The is one white clip towards the inside edge of the panel. 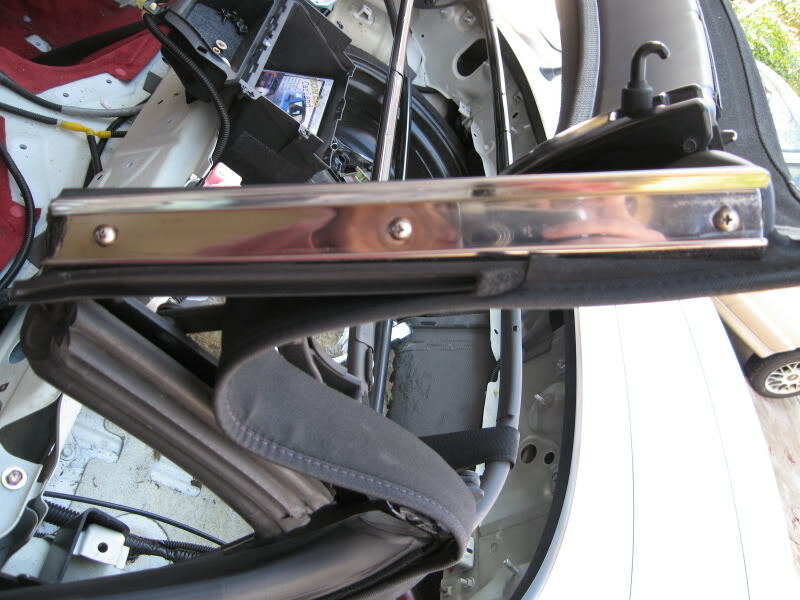 Remove the seat belt holder on the roll hoop. Take the black rubber plug off first and unbolt the assembly. 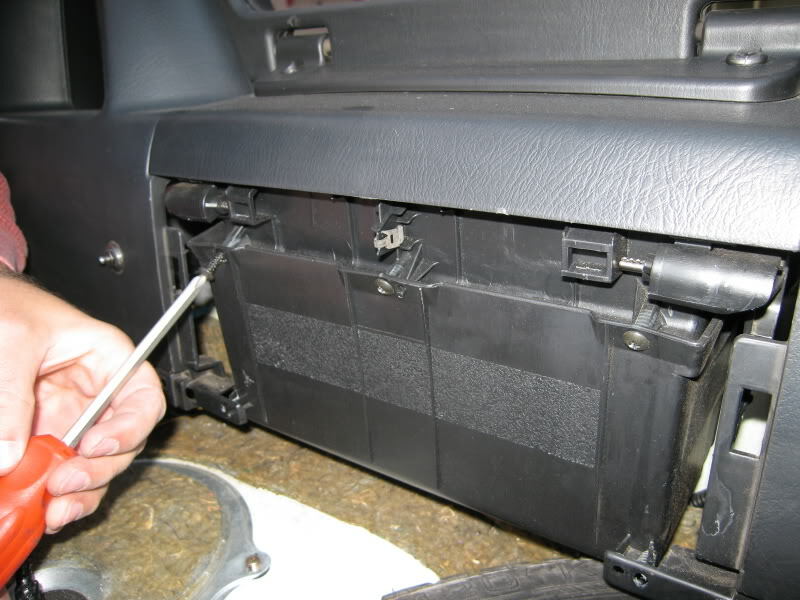 Remove the four screws at the top of the storage compartment and one on the inside of the lower compartment and the two at the bottom of the unit. 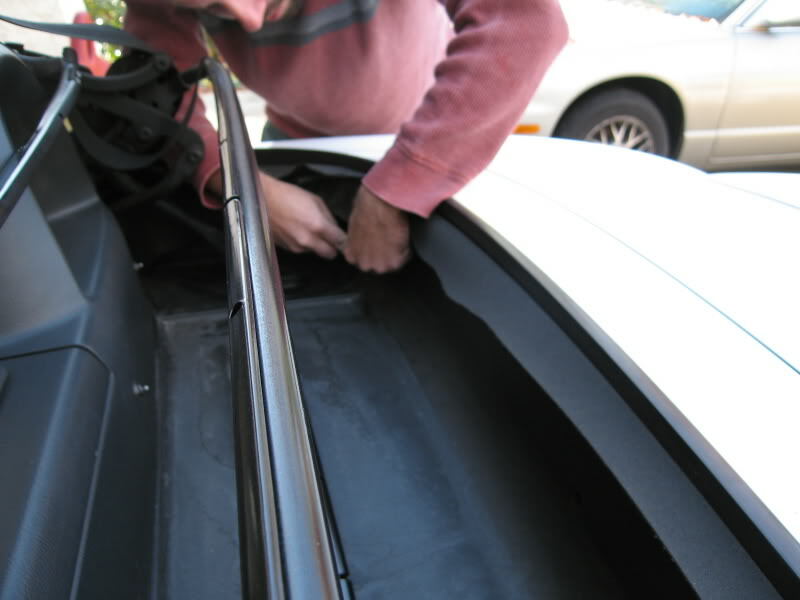 Remove the plastic plugs that hold the rear tray in and parts of the rear roll bar trim. These are removed by pressing the center inward and pulling the button out. 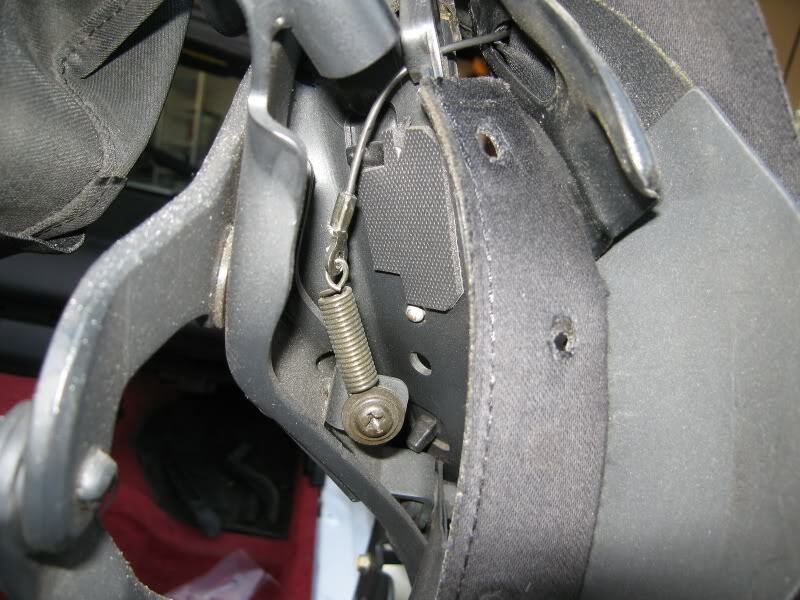 The rear tray can then be removed by prying the rear upwards using a flathead screwdriver. 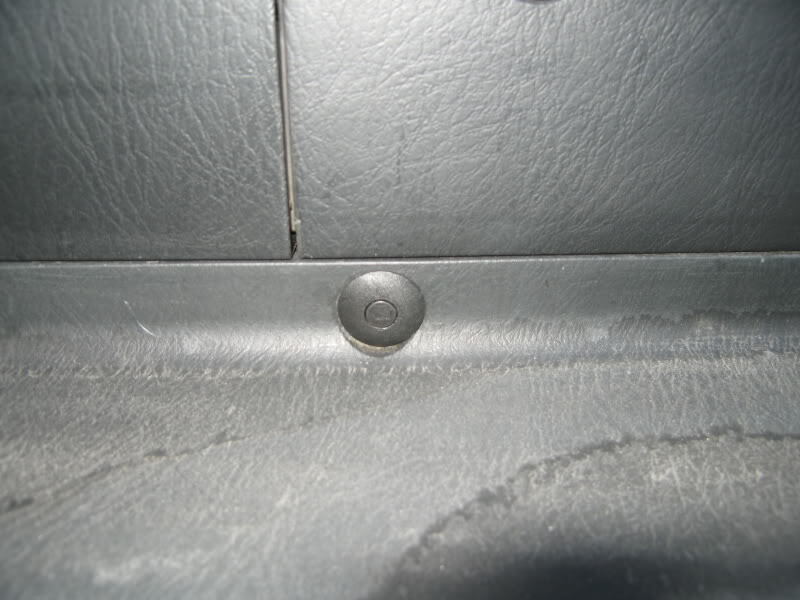 Also, remove the two screws securing the center panel on the back of the console storage. 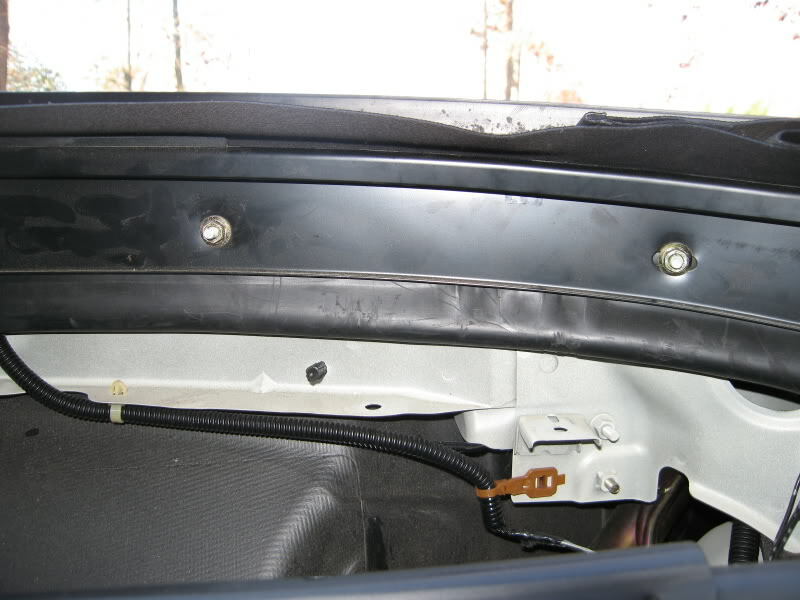 Then, remove the screws attaching the storage compartment to the storage door and housing. Start removing the roll hoops. This is done by removing the eight bolts on each one. Four bolts hold on each side of the hoop. THE ROLL HOOPS DO NOT SEPARATE IN HALF!!! YOU WILL BREAK THEM IF YOU FORCE THEM APART. There is also some debate on whether or not you can complete the installation without removing these. The left and right rain channel trim is below these hoops. You cannot install the top with those in place and you cannot remove those with the roll hoops in. Removing and reinstalling 8 bolts on each side is far less of a pain than breaking parts and installing the top with these in the way. The roll hoops then just lift out. Watch out for any extra screws that you might have missed. 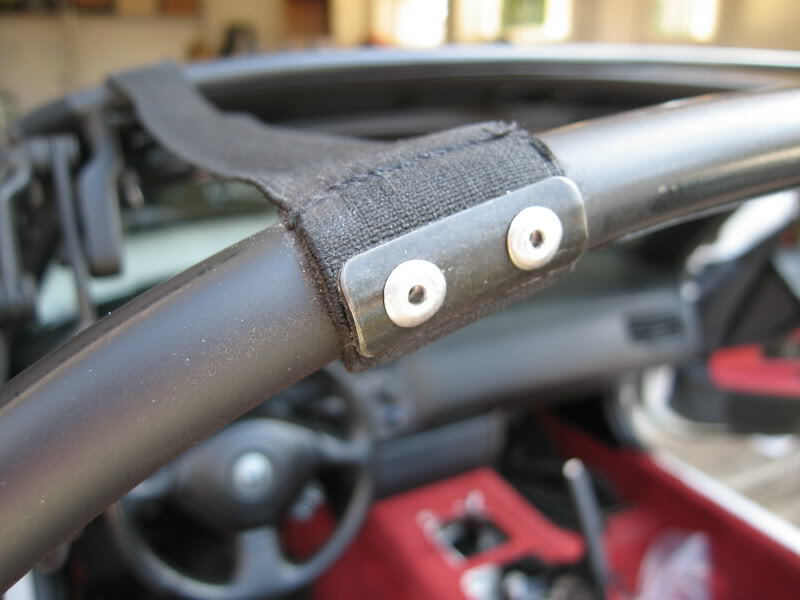 Also, remove the seatbelt through the hole in the hoop housing. 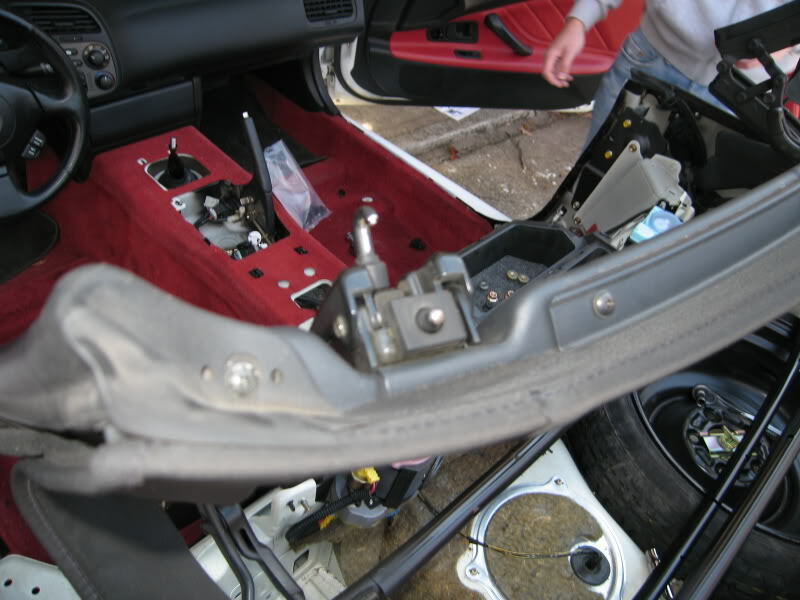 Next, remove the rear top trim by removing the nuts that hold on the three metal trim plates. Remember the orientation of the pieces for reassembly as it's easy to get them put in upside down by mistake. 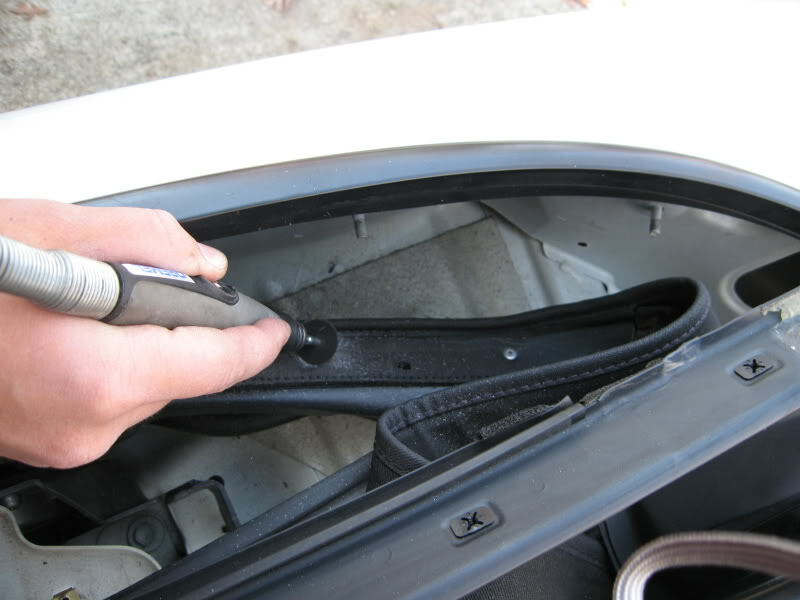 Remove the rubber water channel and place it on the side as you will reuse this. 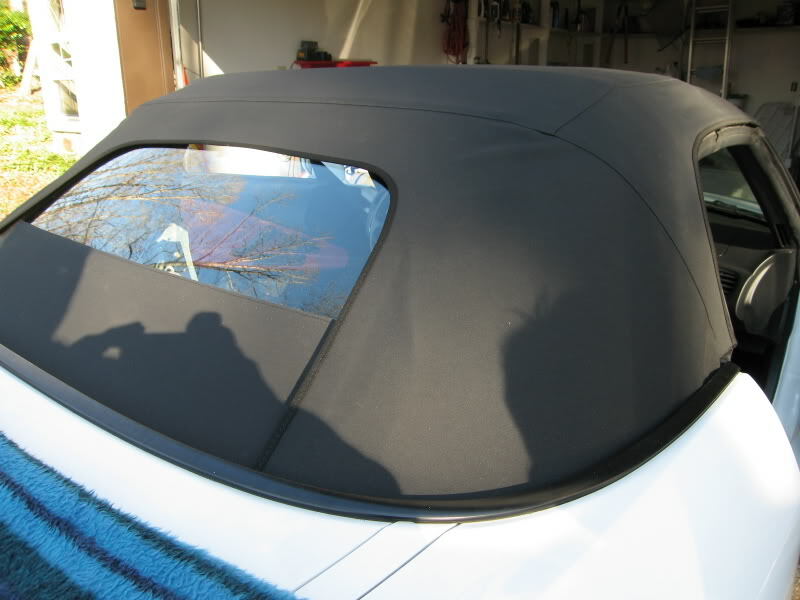 Remove the trim pieces on the top of the roof. You might need to fold the top back halfway. The rubber window trim will come out next. This just pulls off. 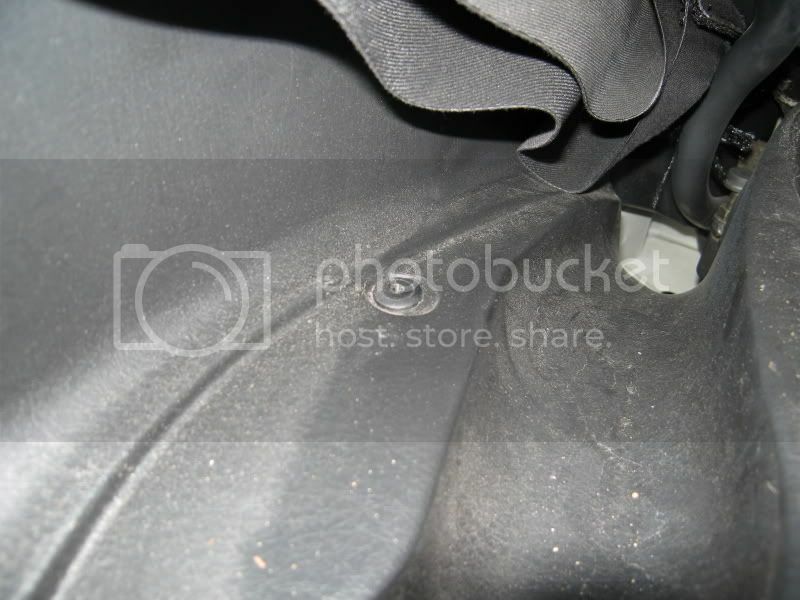 The bottom piece is anchored on with a long plastic plug on the bottom side of the rubber piece (round grey thing in picture). 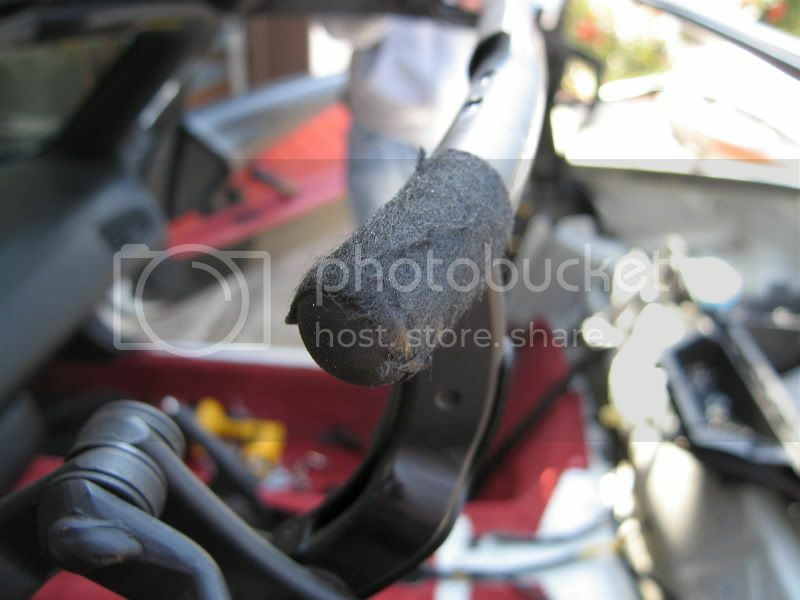 Make sure to remove this first before removing the bottom trim piece. Be extra careful when removing this plug. Use needle nose pliers to slowly wedge it out as it's easy to break. 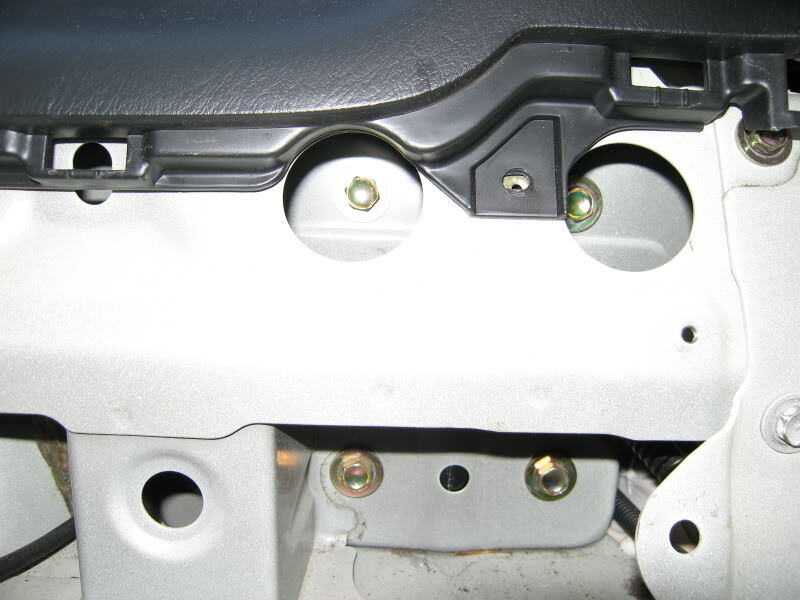 Once the window trim is removed, unscrew the chrome screws and mounting plates. Then, focus back on the bottom section of the window trim area where the long plug was removed. 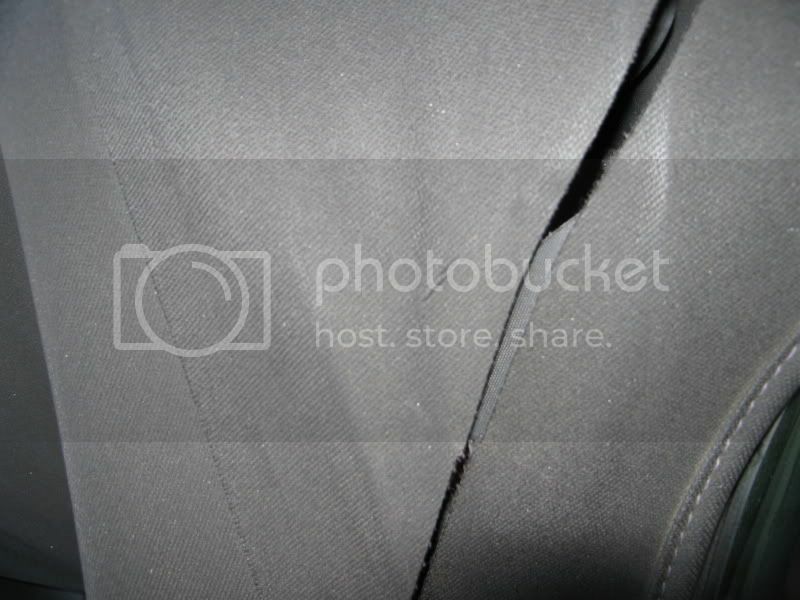 There will be a metal plate holding the corner of the top material down. Remove the one screw holding this in and remove the one screw below the plate (most likely covered in foam and hard to see). Remember how the top is folded in this area as you'll have to duplicate the fold when installing the new top. And any other rivets that might hold the trim on. 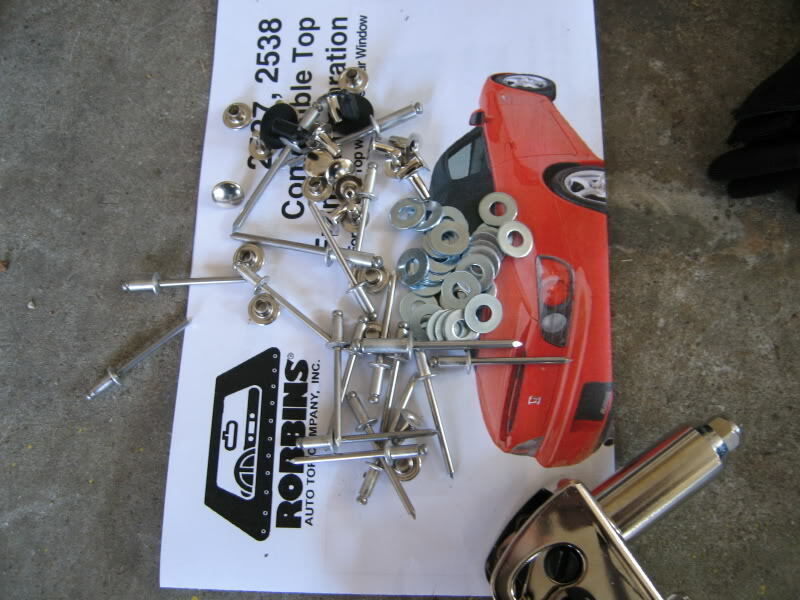 Be careful not to lose the pieces in your car as they will rattle later. 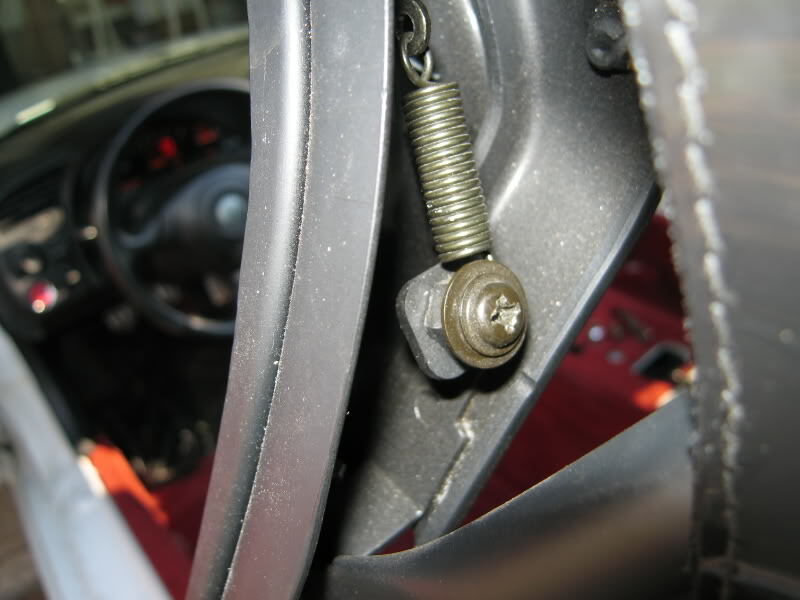 Pull the tension cable through the top and remove it by unscrewing the fat screw at the base of the spring holding the cable. 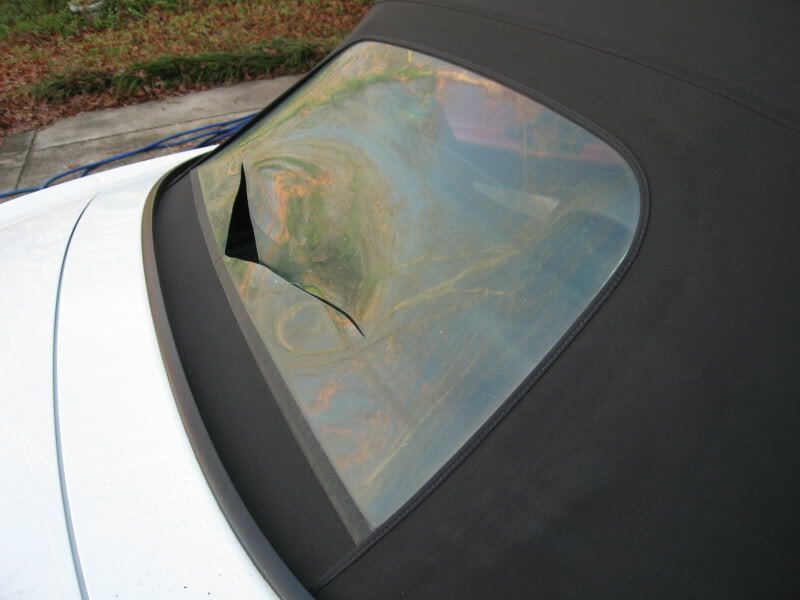 There should now be no remnants of the old top on your car. Now, go to the rubber water guard that was at the rear of the old top. Start drilling out all of the old rivets. Be careful not to heat up the rivets too much as they'll melt through the rubber piece. 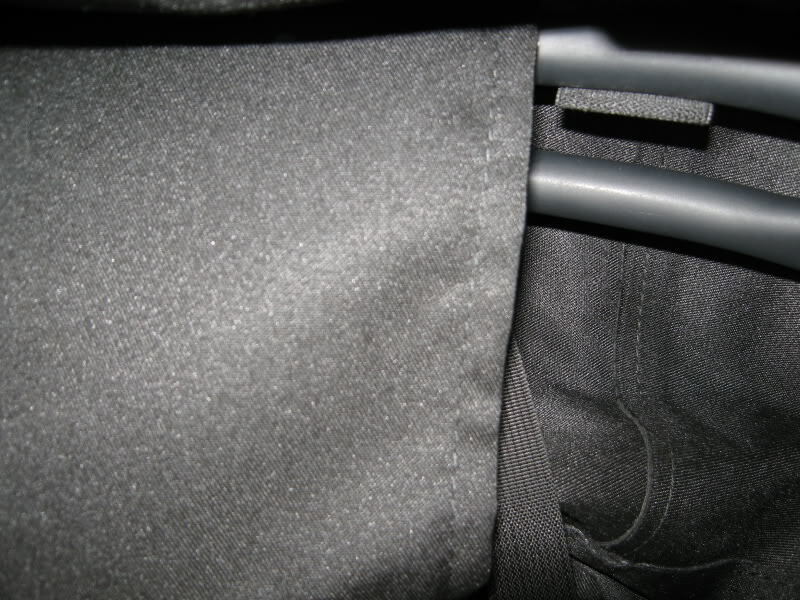 Then, take your hardware bag that came with the top (it would be a good idea to buy a few extra of the larger rivets. They are available at home depot or other hardware stores. Start installing the rear of the new top into the original water guard and riveting it on using the smaller rivets. 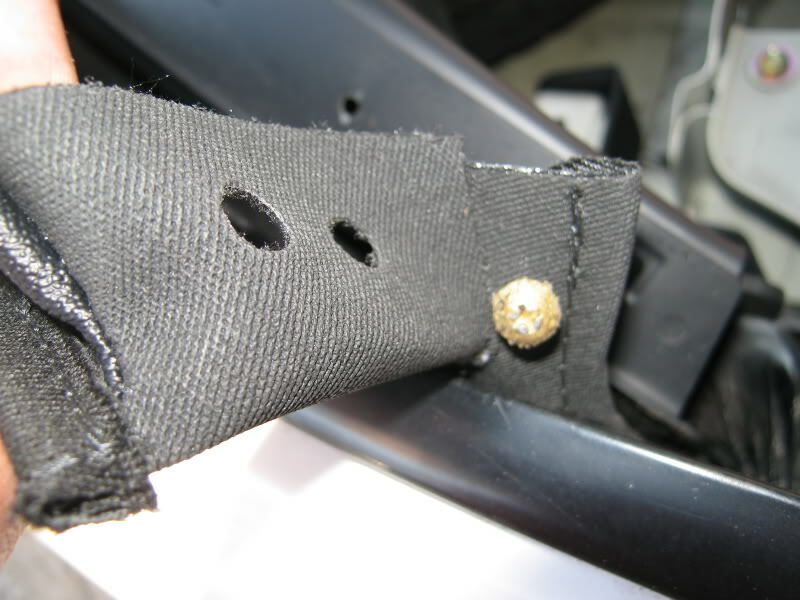 Make sure to only rivet through the holes that are available. 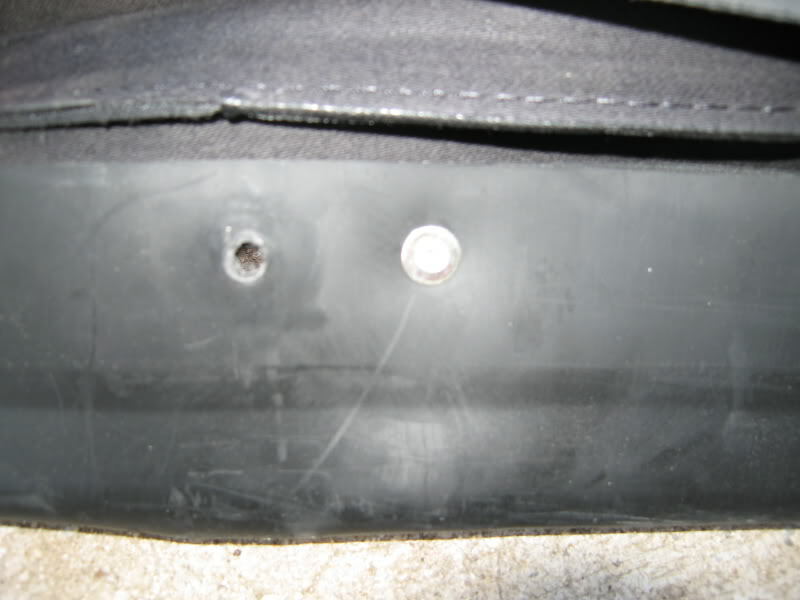 Pay close attention as to what holes need a rivet, and what holes need to be left empty so you can attach it to the car. It's best if you use a pen to mark the attachment holes prior to drilling out the rivets. I found that the larger rivets hold the two halves better so I went out and bought extra ones. Buy washers that fit them as well so the rivets don't pull through the rubber. 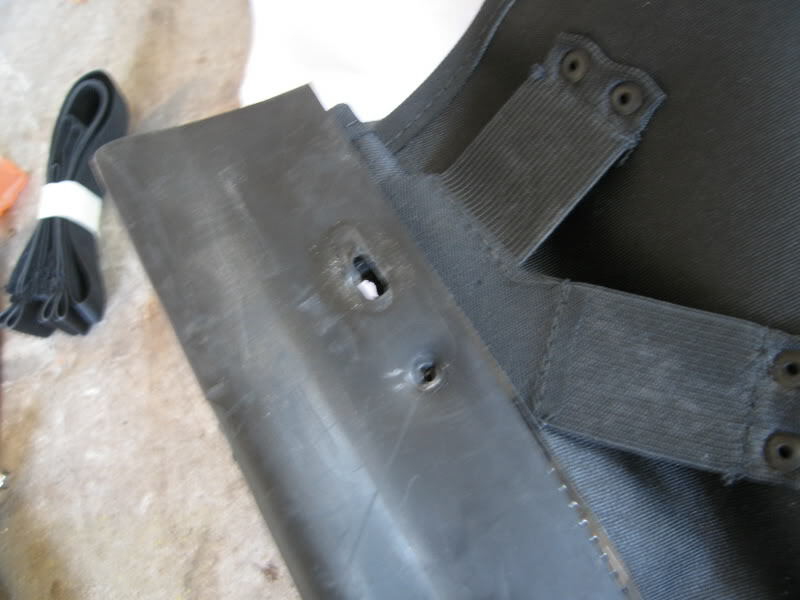 Some of the original rivet holes will not be used because of the way the new top is made. Don't worry about how tight everything is as the rivets are not meant to be the strongest point. 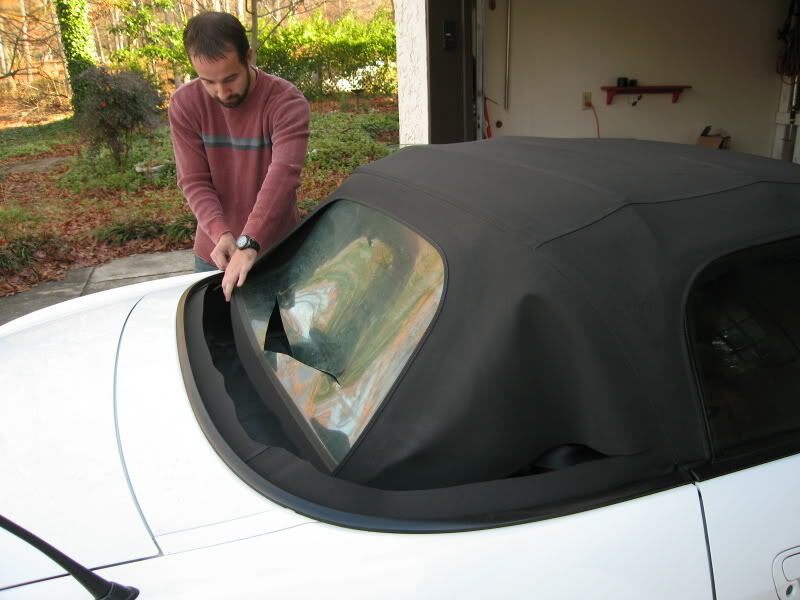 Once the water guard is attached, put a blanket over the rear of your car to protect the paint. Drill out the existing rivets on the top straps. And remove the rivet remains by uncapping the end of the bar and blowing them out the other side. Rivet the new elastic straps to the original locations using the original metal brackets and the supplied rivets. Then, mark holes for the retro fit straps per the instructions in the top box. 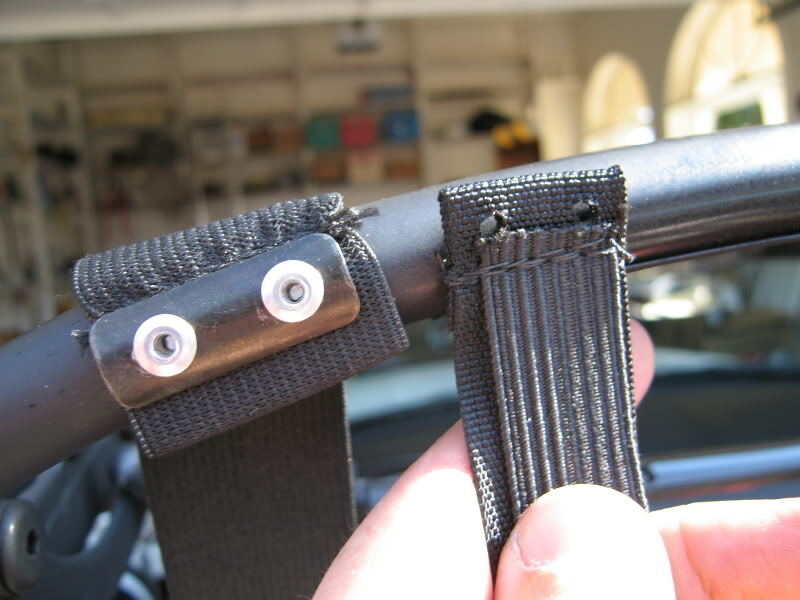 The retrofit straps should be one half inch away from the elastic straps. The new Robbins tops are coming with all the straps already joined together which will save you some drilling and riveting. Drill the frame and attach the straps with the rivets as per the instructions provided. Make sure to attach the straps to the back of the bar. If the rivets or the straps are on the top surface, it will wear on the new top. Next comes the difficult part. 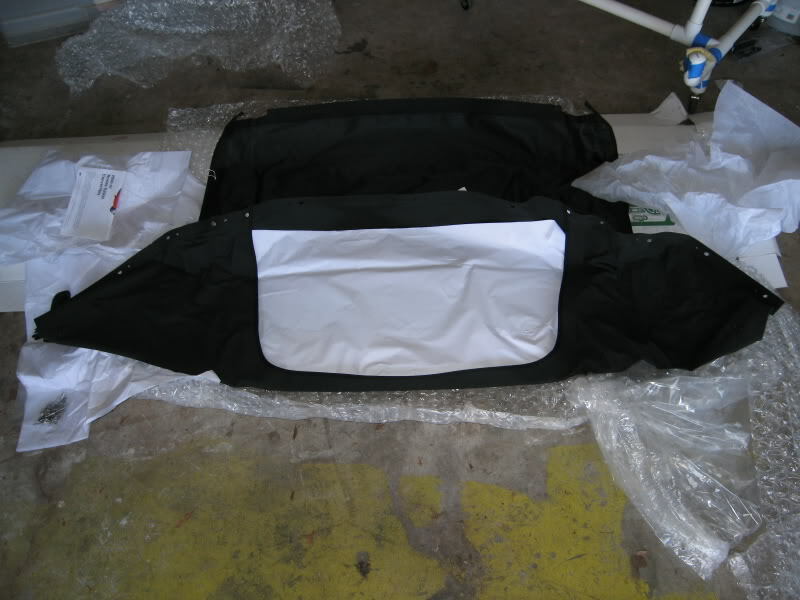 Place the top upside down on the trunk ready for install. 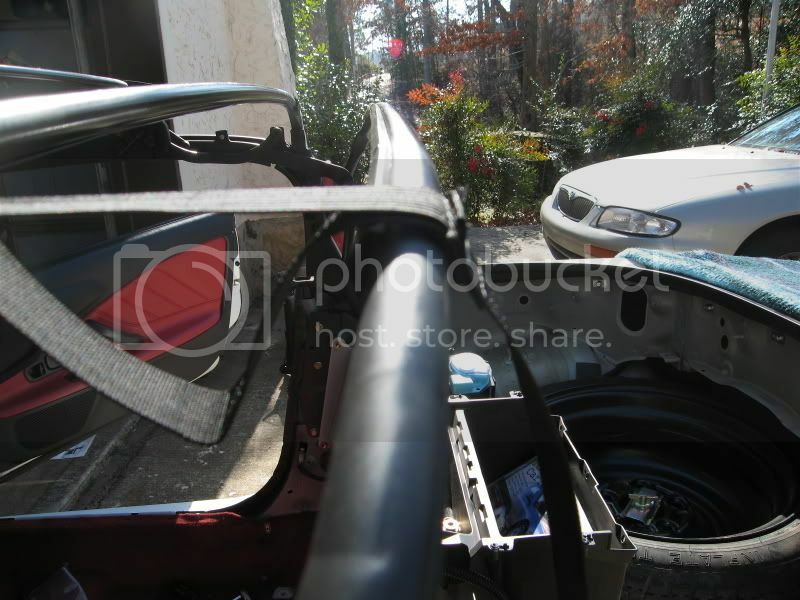 Flip it over onto the top frame and start pushing the rubber water guard onto its mounting pegs. They can be hard to push through in some areas and it helps to have someone hold the top off of you while you push the rubber guard into place. Next, fold the top mechanism halfway back. 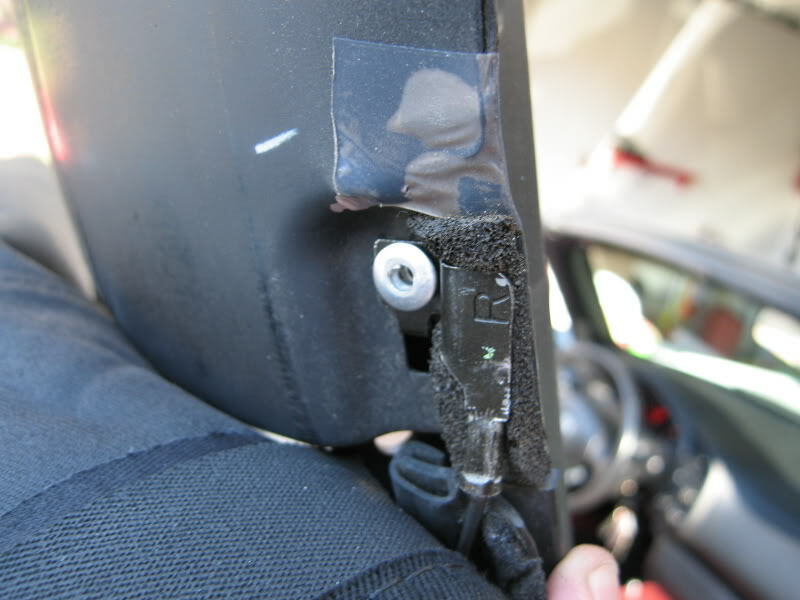 Take the long straps and attach them to the mounting peg directly behind them in front of the rubber guard. 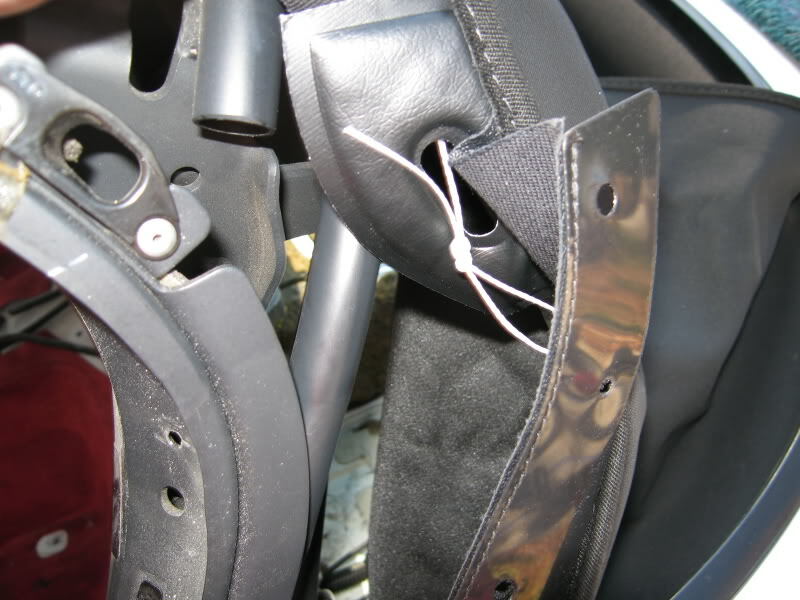 While keeping the strap in place, replace the metal trim pieces onto the metal pegs. Place the nuts on right away to keep it from falling off, but don't tighten them just yet. Once all the pieces are on, start tightening the nuts. Tighten the center one first and move outside from there. Start folding the top over the rails. 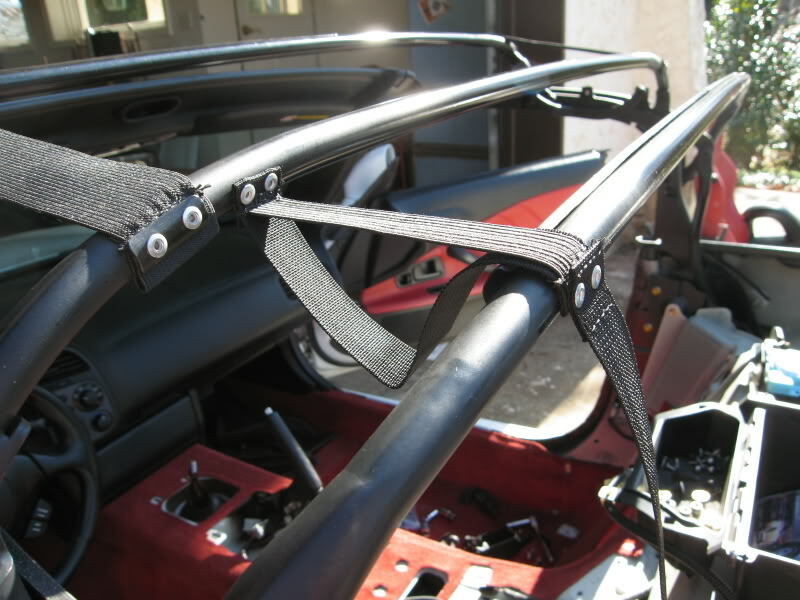 Begin by taking the two flaps towards the back of the top, velcro them together, put them over the rearmost bar and go under the second bar, and insert the plastic edge into metal trim strip. The bar rearmost bar should not be inside the two flaps. Do the same thing with the second section as well for the third bar from the back. Next, take the tension cables removed from the old top. Hook the spring with the white loop on the new top. Pass the cable from top to bottom by pulling it through with the string. Take the lower corner that goes next to the window of the new top and insert a screw through the bottom side. This was the screw covered in foam on the old top. There should be a hold in the plastic backing for the screw to pass through, but not in the material part. Take the metal clip and reinstall it just as you removed it. This is one of the most difficult parts of the install b/c of the area available to work in. It really helps to have a ratcheting screwdriver that's really, really short. A screwdriver attachment for a ratchet might even be better. There is also a lot of pulling and stretching going to get the top to fit right and pull the corner into place. Next, rivet the top of the tension cable back into place using one of the large rivets. You might need to drill the hole a bit to get it to fit. It's all downhill from here. 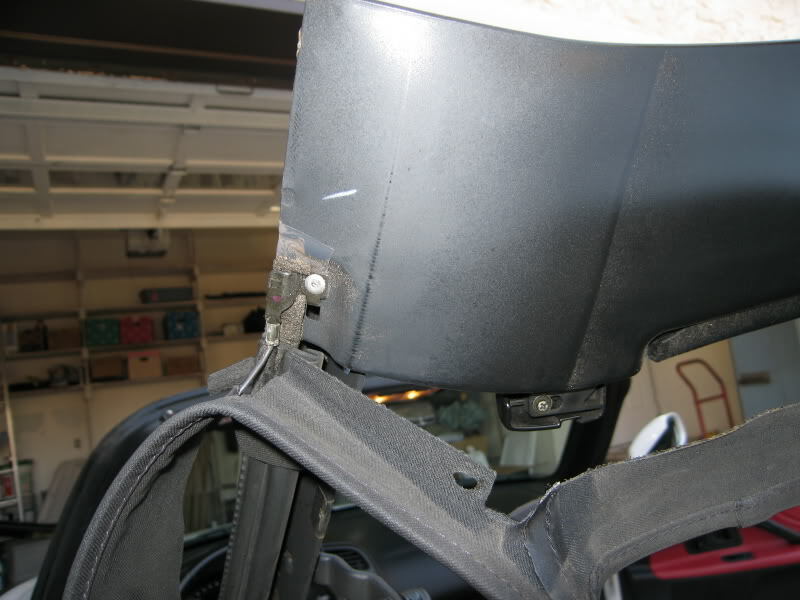 Start putting the trim pieces back just as you took them off. Don't worry about closing the top just yet. 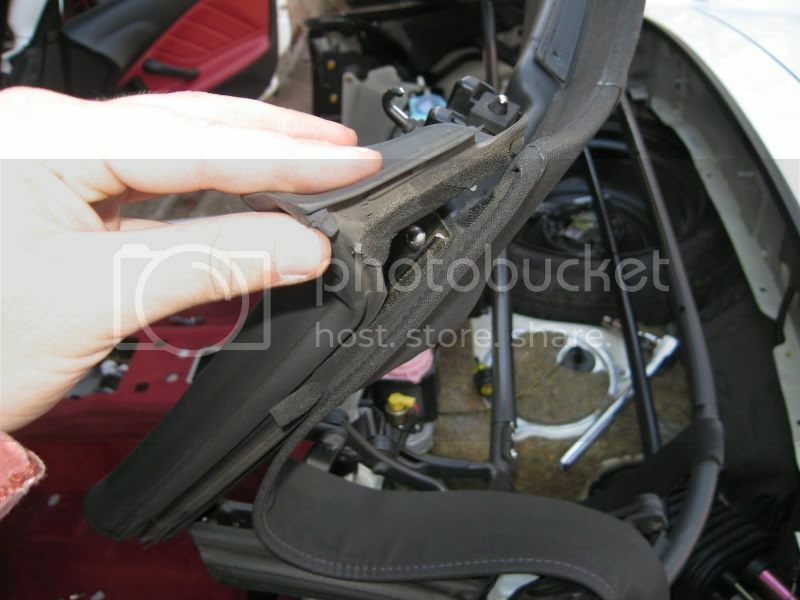 Pay attention to the rubber molding pieces as they can be hard to snap back in and can fall out if you're not careful. 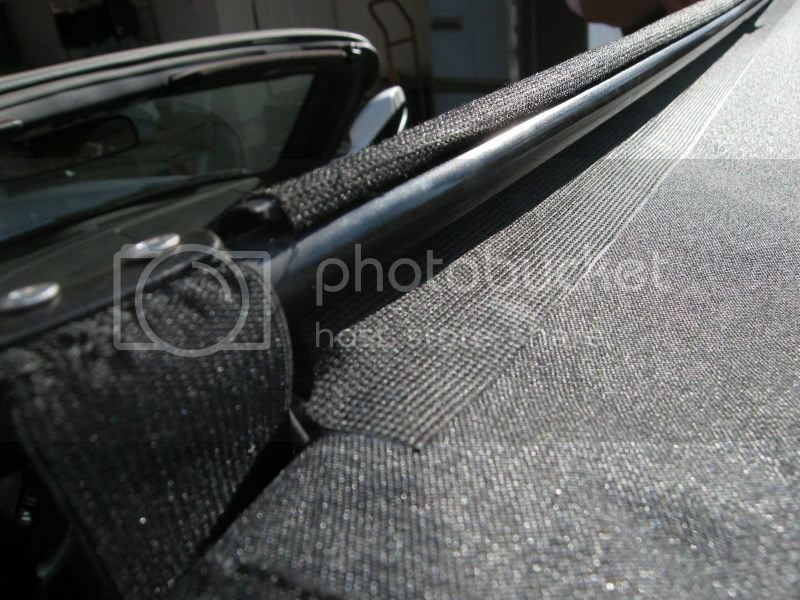 Also, remove the two inner tonneau cover metal clips on the back of the roll hoop. DO NOT FORGET TO DO THIS WITH THE GLASS TOP CONVERSION. The inner two attachment points interfere with the glass top folding all the way down. 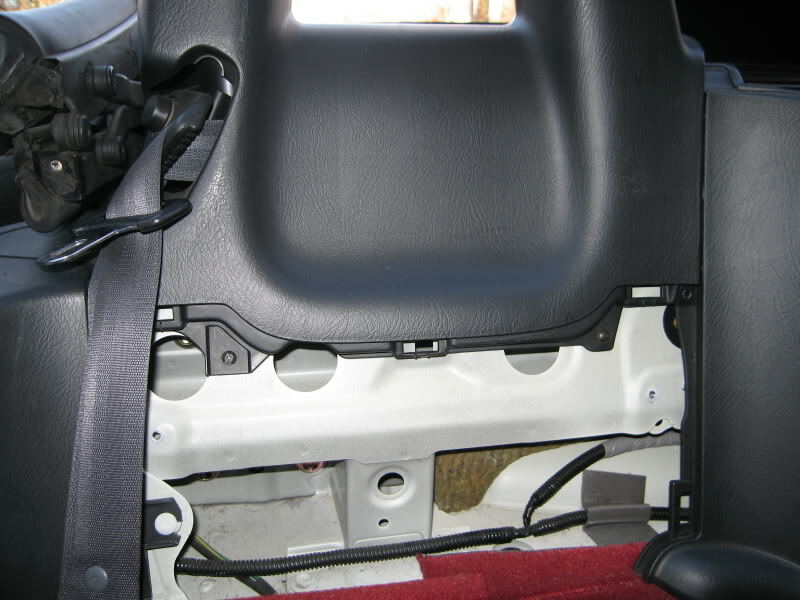 Install the interior just as you removed it. Everything will be more of a pain to put back in now b/c the top will be there covering up the back. The rear tray might need to be fed in through the back. 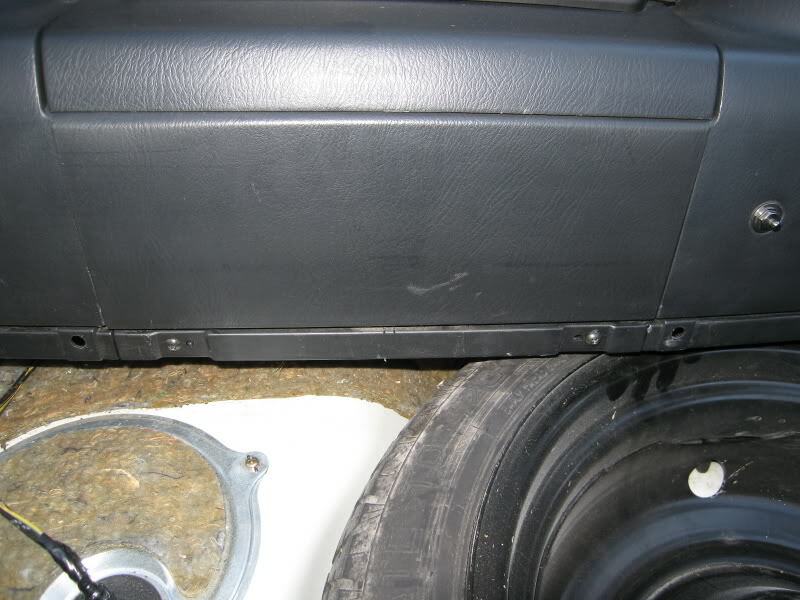 You can do this by removing the covers over the spare tire. 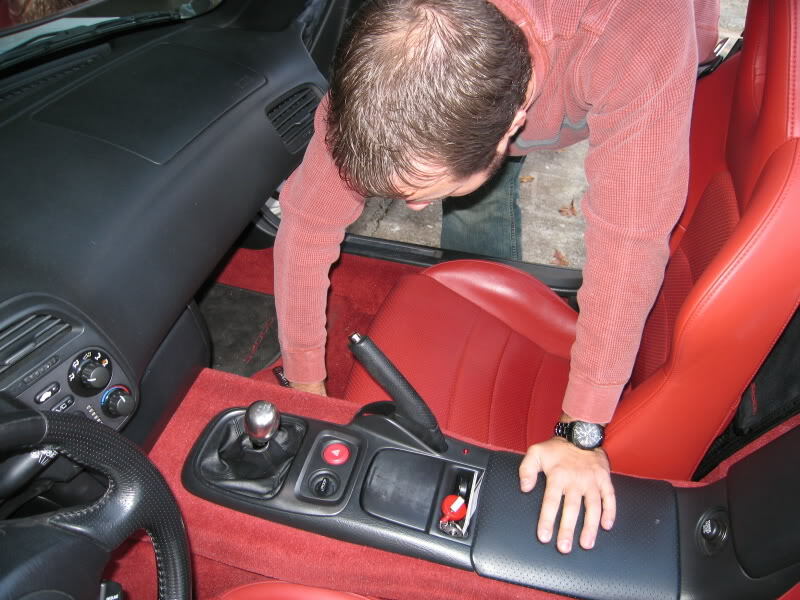 After all the trim is back into place and you have your car back together, fold the top up to close it. Since it is new, it will not close all the way. It is best if it's a warm day or if the top is warm. If it's cool, run your heat on for a while to warm up the new top. 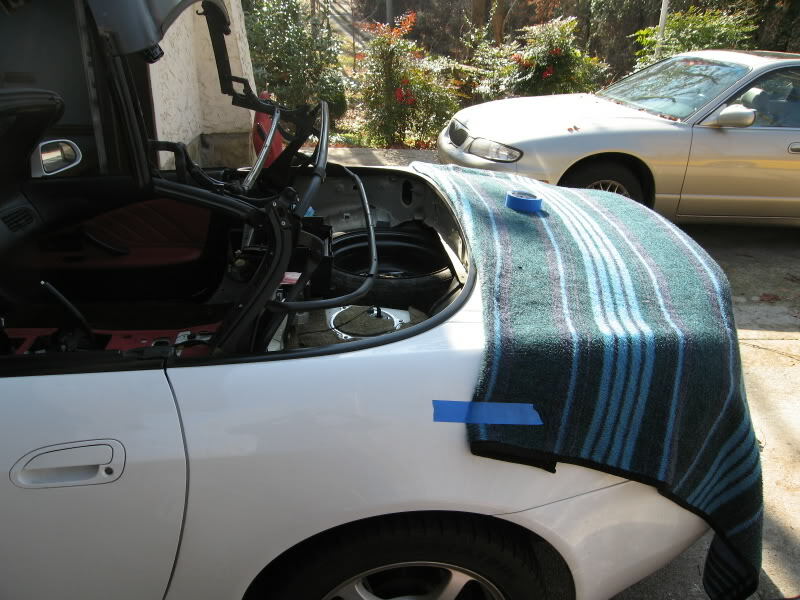 Once it's warm, do your best to push the top down and latch it into place (this usually requires two people). Once latched, leave your top latched for about a week to let it stretch into place. If you can park it outside on a sunny day to warm it up, it is preferred. Hopefully everything went smoothly and it didn't take too long. Without any problems, the install takes approximately 6-8 hours. When folding the top down the first few times, you might have to guide the glass down with your hands to get it to slide correctly and to avoid the top folding incorrectly. Do not just fold the top down right away without paying attention. Monitor the top as it goes down slowly the first few times to ensure the bars are folding correctly and they don't break the glass. 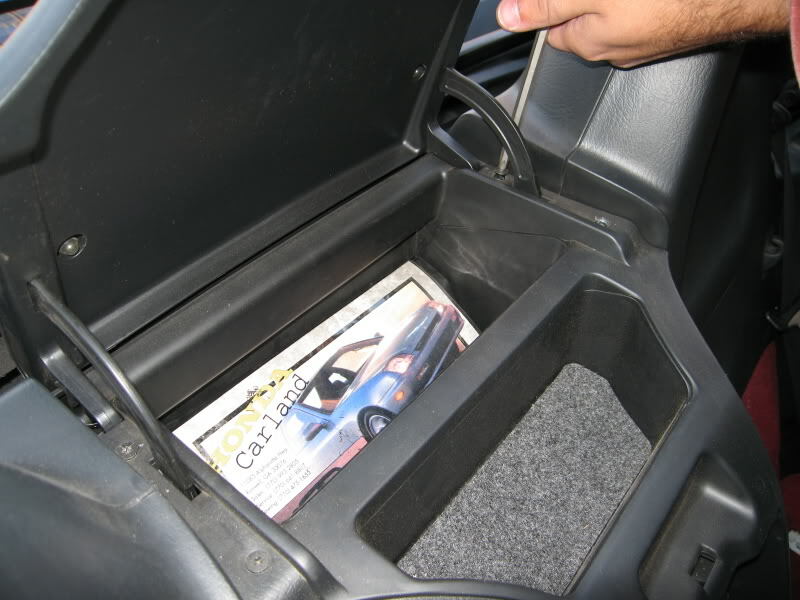 Also, remember the glass back does not fold deep into the rear tray area like the plastic back. The front windshield bar should sit either level with the trunk or just below. Fantastic write-up, Cyclon!!! Nice work. I sure as hell wouldn't try that by myself, though. Nice job...and timely...I think there are about 5 Florida guys about ready for new tops. Definitely needs a link in the DIY sticky in UTH. 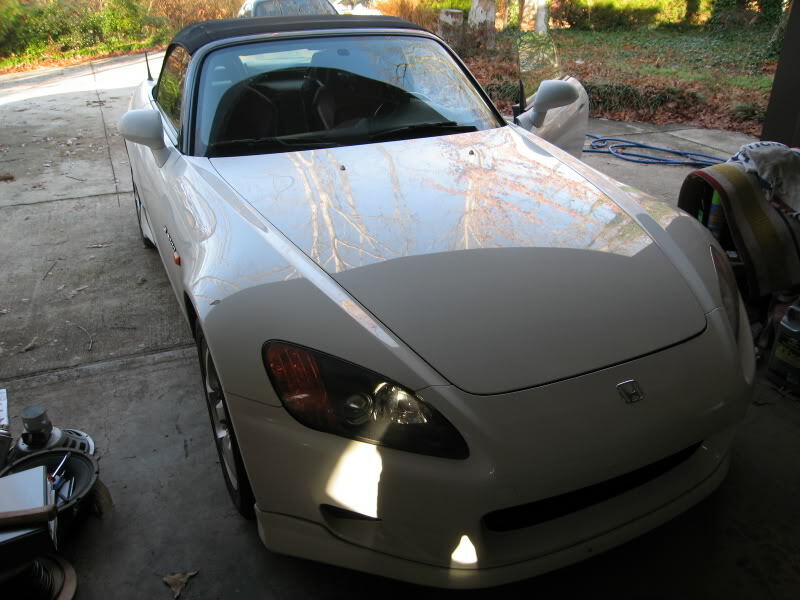 negcamber, FYI I put a link in the S2K Talk FAQ, but feel free to PM the mods in UTH. anyone know a good installer for this job in ny metro/long island?